Our SleeveGuards and WeatherChaps provide all-weather protection from wind, rain, and cold. 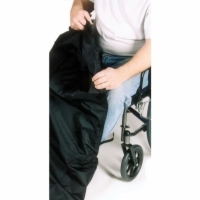 Fleece-lined and waterproof, these garments fit over normal clothing to keep you warm and dry during inclement weather and prevent damage to expensive clothing while you're using your electric scooter or power wheelchair. SleeveGuards protect your arms from dirt and moisture that can ruin expensive clothes. They slip over your forearms to protect your jacket and shirt sleeves. 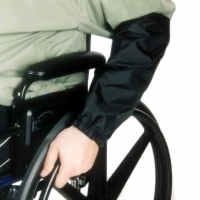 Keep yourself warm and dry while you use your mobility scooter or power wheelchair! Adult WeatherChaps snugly fit your lap, legs, and feet to keep them drier than a poncho can. To use it, slip your feet into the bottom pocket and then pull it over your lap and legs. WeatherChaps are waterproof, lined with fleece for warmth, and can be put on without leaving your seat. Pediatric WeatherChaps snugly fit your lap, legs, and feet to keep them drier than a poncho can. To use it, slip your feet into the bottom pocket and then pull it over your lap and legs. WeatherChaps are waterproof, lined with fleece for warmth, and can be put on without leaving your seat. Extra Wide Adult WeatherChaps snugly fit your lap, legs, and feet to keep them drier than a poncho can. 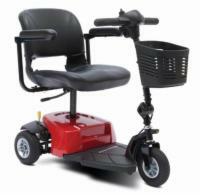 To use it, slip your feet into the bottom pocket and then pull it over your lap and legs. WeatherChaps are waterproof, lined with fleece for warmth, and can be put on without leaving your seat.